The Hollywood award season is upon us and with it should come some juicy new headline-making moments. 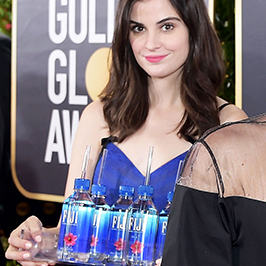 The Golden Globes is one of the biggest nights for the entertainment industry, yet this year’s big winner was not a celebrity: The Fiji Water Girl became the talk of the town because of a clever marketing stunt. Fiji Water has been a sponsor of the awards since 2015, but most viewers may not have known that until this year, when the model holding the bottles on the red carpet appeared in many photographs that were shared on social media. Here are a few public relations and marketing lessons from the Golden Globes. Acceptance speeches can be awkward to watch, especially when they are not prepared beforehand. There’s really no excuse for witnessing these often cringe-worthy moments. Even though the nominees know that they have a chance of winning and a limited timeframe to thank those who helped them, those who aren’t prepared often struggle to find the words when it’s their turn to accept an award. The same holds true for media interviews — especially those that will be broadcast. When preparing for an interview, it’s important to understand the nature of the medium and know something about the topic at hand, and to have reviewed the types of messages you want to deliver. Think on your feet and go with the flow. If the Fiji Water Girl was a calculated PR stunt, the company has yet to admit to this. Rather, it seems like the model seized the opportunity to position herself into photos with the most-notable celebrities. The so-called “photobombing” went viral only after social media users began spreading the images. Sometimes, an unplanned branding opportunity can result in a success, so we have to be prepared to seize the moment. It’s been reported that many Twitter users are calling on Fiji Water to make the model its new spokesperson. The microphone is always hot. The Golden Globes brought controversy when social media channels buzzed about hearing “This Is Us” star Chrissy Metz on a hot mic during a pre-show interview, saying some not-so-nice things about Alison Brie. The lesson here? The mic is always hot — even when you think it’s not, so, take care and always think before you speak! Your talking points may turn into comedy gold. If you’ve had the benefit of effective media training, you know the importance of identifying and rehearsing your talking points. Still, you want to avoid a robotic delivery and weave your key message into the conversation naturally, especially when answering an interviewer’s questions. Just look at what just happened to Lady Gaga during the Golden Globes: The producers of the awards show pieced together an interminable clip of Gaga during her press tour promoting “A Star is Born,” where she repeated the same story over and over. “There can be 100 people in the room and 99 don’t believe in you. But if just one does, it can change your life.” While it was very funny, the clip became comedy gold and clearly embarrassed Lady Gaga. Authenticity is a key to building your brand and securing new business. Let your clients and prospects learn a little something about who you are. People tend to hire people they know, like and trust. I’d love to hear your public relations and marketing takeaways from the Golden Globes. Contact me at laltman@jaffepr.com.